Brent at the Foliar Pathology Lab research vineyard where the small plot field trials in his project were conducted. Viticulture is the science, production, and study of grapes, and when growing grapes for wine both quantity and quality matter. One challenge facing farmers in the Willamette Valley is a plant pathogen: grape powdery mildew. This pathogen can live in a field year-round and emerges to infect grape leaves, flowers and fruits annually. Grape plants infected with powdery mildew suffer low berry yields and mildew may affect the taste of wine. In the Willamette Valley, where vineyards abundant, grape powdery mildew is a big problem. 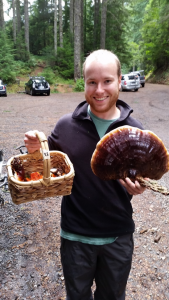 Brent Warneke, a Master’s student in the department of Botany and Plant Pathology, is studying the effect of fungicide application timing on the reduction in severity of powdery mildew on grapes, and he is our guest on Inspiration Dissemination this week. A grape bunch severely infected with powdery mildew. Note the berry cracking, powdery appearance, and poor color accumulation. Brent works at the USDA Horticultural Crops Research Lab with Walt Mahaffee, and his research tests the effect of fungicide application timing on grape powdery mildew control. Timing fungicide applications is especially crucial during the one to three-week window of grapevine flowering. 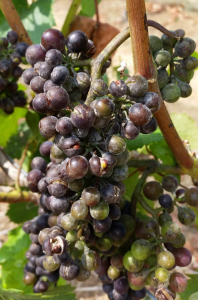 Optimal fungicide application timing can slow the mildew epidemic allowing grape berries to mature and become less susceptible to powdery mildew. 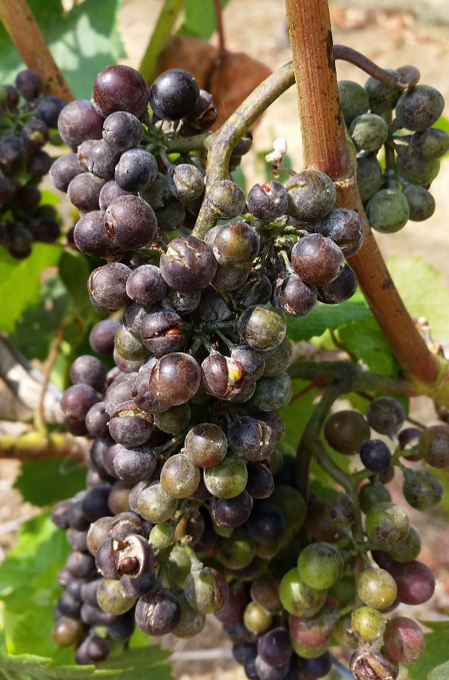 Across the Willamette Valley, fungicide application to grapes is a well-known prevention solution for powdery mildew, but less is known about the best fungicide to use and when to spray plants during berry development. The findings of his research are now being validated at a larger scale in commercial vineyards. In the lab, Brent is also studying the mobility of fungicide “through the grapevine,” from tissue to tissue through the air and xylem, and Brent is helping with a project to identify strains of mildew resistant to commonly used fungicides. 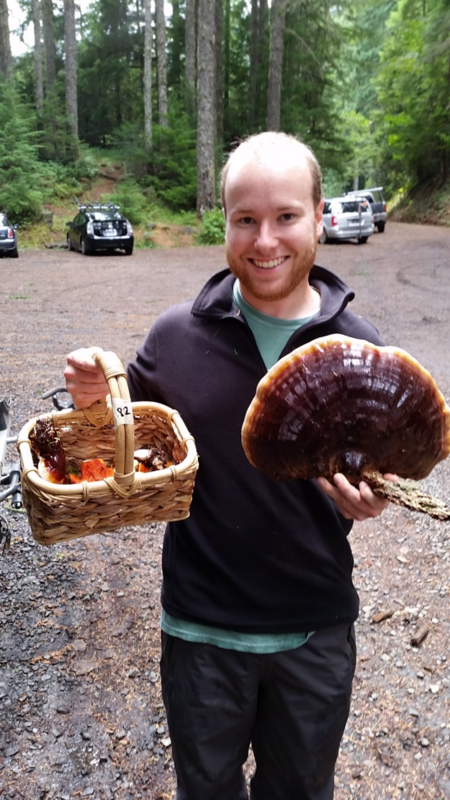 Brent with a harvest of varnish conk (Ganoderma oregonense), Lobster mushroom (Hypomyces lactifluorum). Brent hails from Colorado where he spent his early years outside gardening, snowboarding, and hiking. 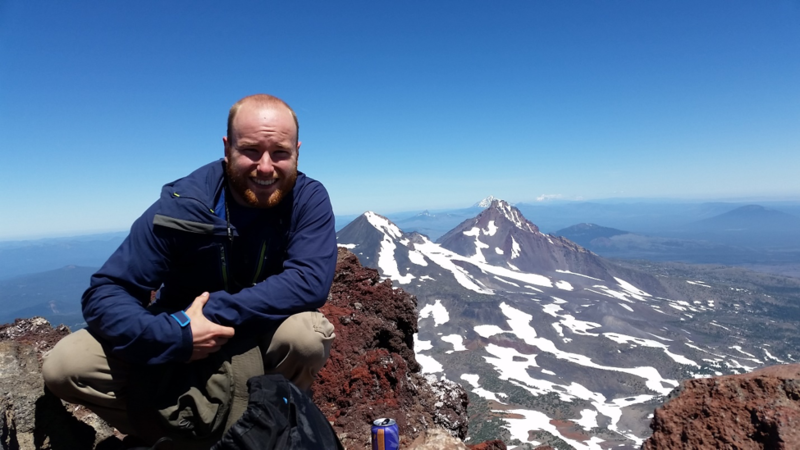 During undergrad at Colorado State University (CSU), Brent majored in Horticulture and held research positions at the Center for Agricultural Resources Research and the Bioenergy Lab. Among his many projects during undergrad, Brent completed a senior thesis project, under the direction of Dr. Courtney Jahn, developing a LAMP-PCR to diagnose Canada thistle rust on infected plants that were not displaying symptoms. While at CSU, Brent also began studying viticulture. He liked the challenge and complexity of growing grapes for wine. 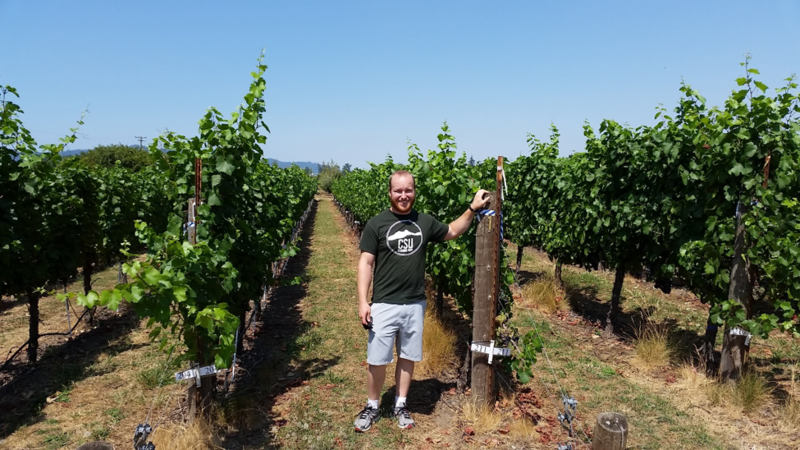 Brent chose to pursue graduate school at Oregon State because his current program blends plant pathology with viticulture. He’s happy with his decision because Oregon is similar to Colorado for outdoor recreation, not to mention its world class Pinot Noir! Hear more from Brent this Sunday September, 10 at 7PM on KBVR Corvallis, 88.7FM! Not a local listener? Not sweat! Stream the show live. Brent on top of South Sister (10,363 ft). Middle and north sister can be seen in the immediate background. In the far background the small peak to the left without snow is Mount Washington , then Mount Jefferson behind north sister and Mount Hood in the background to the right of North Sister. This entry was posted in Botany and Plant Pathology and tagged fungicide, grapes, mildew, pinot, plant pathology, recreation, research, vineyard, viticulture, wine on 2017-09-08 by Kristen Finch.